Newly-appointed GAL Mary S. Rowan (seated in blue dress) grabs Maulauni Williams’ arm as she berates VOD reporter (r) for covering the story in the courtroom. Pamela Reid of Faith Connections is at left, with Mailauni’s sister Monique Williams at center. The day after the hearing, Rowan seized Mailauni from Reid’s group home. Her whereabouts are currently unknown. 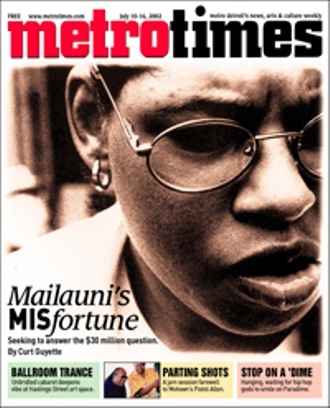 Metro Times cover story on Lennette and Mailauni Williams, by Curt Guyette, July 10, 2012. 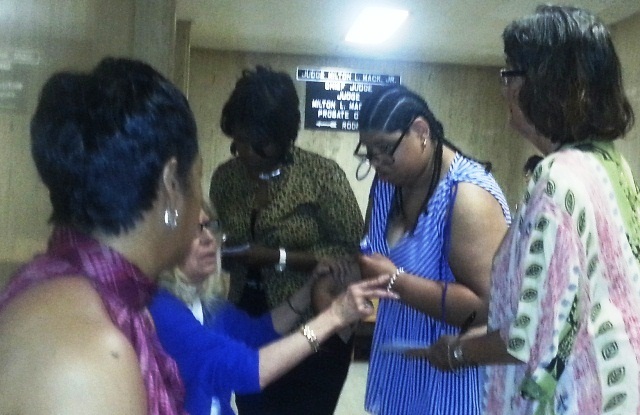 DETROIT – Mailauni Williams begged to hug her mother Lennette Williams and her sister before Judge Kathryn George ordered the mother jailed 10 days for contempt during a chaotic, hostile hearing June 13 in the chambers of Wayne County Probate Court Chief Judge Milton Mack. “I am her daughter,” Mailauni cried out from the audience to the judge. “I just came to give her respect.” She told the judge “I cried,” when she was taken away from her mother during a raid May 22 by Grosse Pointe Farms police and deputy sheriffs. She got up and hugged her mother during the hearing after she heard the judge berate her. Her temporary guardian, Pamela Reid of Faith Connections, took her out of the courtroom later so that she would not have to watch sheriffs put her mother under arrest. Williams has been her child’s guardian for over 20 years, but George stripped her of that role. She also denied her access to a $30 million lifetime support settlement paid by Henry Ford Hospital for birth trauma that left Mailauni with cerebral palsy and her mother, now 62, with physical injuries. 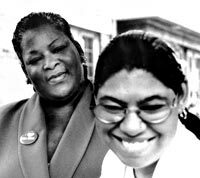 Lennette and Mailauni Williams in 2002; photo Metro Times. Without access to those funds, Williams is in danger of losing the home she purchased for herself and Mailauni in Grosse Pointe Farms. She has been a full-time caregive for her daughter since her birth. 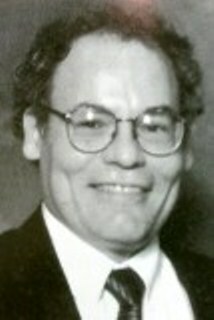 George, blatantly hostile towards Williams and her attorney, denied an alternate petition for guardianship from Mailauni’s sister Monique Williams, despite estate trustee Walter Sakowski’s recommendation in favor of it. She then appointed a white guardian ad litem, Mary S. Rowan. George said she would not consider any alternative for at least one year. 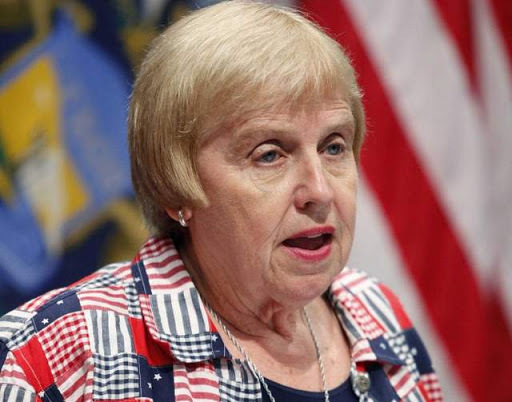 Macomb County Probate Court Judge Kathryn George was removed as Chief of that Court in 2008 for assigning most of her cases to an agency that an audit found had egregiously defrauded wards of the court. Mailauni’s sister testified that she was petitioning for guardianship only as an alternative to the temporary guardianship of Faith Connections, enacted when Mailauni was seized. She told Folmar during the hearing that she felt Mailauni was safe with her mother. George then authorized MORE legal fees from the estate at the rate of $75 an hour to one Robert Kent. Reid, who brought Mailauni to the hearing, testified about the young woman’s seizure from her home in Grosse Pointe Farms May 22 by carloads of city cops and sheriffs. Home of Lennette and Mailauni Williams, where Grosse Pointe Farms police and sheriffs kicked in door May 21. This has been the only home Mailauni has had for most of her life. Police kicked in the door after Adult Protective Services (APS) worker Hiram Williams went to the home, ostensibly for a “wellness visit,” according to testimony. 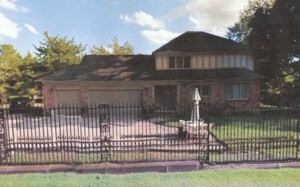 Mailauni, however, was at the home of family friend Deborah Edwards at the time. Lennette Williams testified she called Edwards to have Mailauni brought home when the APS worker appeared. Edwards told VOD that the APS worker actually left the home for two to three hours at the time, saying he was going to lunch. But he drafted a court order to seize Mailauni during that time, and returned with Grosse Pointe Farms police and sheriffs to take her. Police invaded the home, kicking down the door and pointing guns according to witness accounts. Folmar is also the criminal defense attorney for Maryanne Godboldo, who stood off a SWAT team of Detroit police in 2011 for hours before they seized her daughter, to force her to take the dangerous drug Risperdal. Two judges have dismissed criminal charges against Godboldo three times, but she faces another court hearing June 25, 2014 at 9 a.m. in front of Judge Gregory Bill, who dismissed the charges earlier. In the interim, a hearing was held May 19 in front of Chief Judge Timothy Kenny, evidently to reinstate the charges after 36th District Court Judge Ronald Giles dismissed them again. 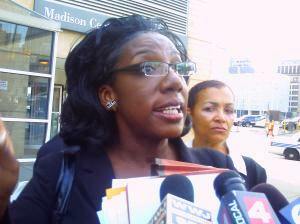 Attorney Allison Folmar speaks to media about police arrest of Maryanne Godboldo, after court hearing July 8, 2011. George gave Faith Connections temporary custody of Mailauni after her seizure. Reid took Mailauni to a group home on East Grand Boulevard. The morning after the June 13 hearing, Rowan went to the group home and removed Mailauni yet again, over Reid’s protests that she was safe and loved there. Her current residence is unknown. 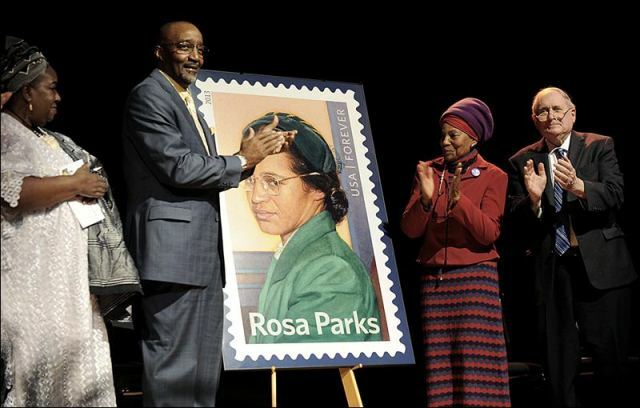 “When the police and APS show up, they have all the authority,” George contended, citing Williams’ alleged failure to allow them in to her home and, earlier, to produce her daughter’s medical records as cause for finding her in contempt. She also showed photos of signs on Williams door threatening trespassers. She said she originally intended to jail Williams for 30 days. Folmar objected to George’s presentation of her court clerk as an unsworn witness. The clerk read an email from the APS worker, who was not present at the hearing for cross-examination. Folmar also said she had the right to cross-examine police who seized Mailauni, who were not in the court, and to present witnesses on Williams’ behalf. Grosse Pointe Farms police. The Williams family has faced racist harrassment for years in the predominantly white suburb of Detroit. George held Folmar in contempt of court twice during the hearing, fining her $150. “She clearly wanted to put Attorney Folmar in jail, too,” Squires commented. At the outset of the hearing, Folmar, newly retained after many hearings where Williams had no attorney, asked for a new beginning. 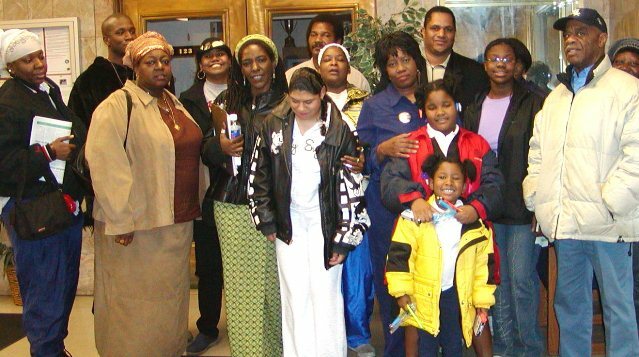 Members of the Original Detroit Coalition Against Police Brutality after they testified at a Police Commission hearing several years ago. Mailauni is at center in white dress, with her mother Lennette behind her; to her left is Arnetta Grable, and behind her is Cornell Squires. Grable spearheaded a 10-year campaign for justice for her son Lamar Grable, killed by Detroit police officer Eugene Brown in 1996. Family supporters present in court included Edwards and Arnetta Grable, both long-time friends of Williams, Cornell Squires of We the People for the People, who has worked with the family for over 20 years, Elaine Steele and Anita Peek of the Rosa and Raymond Parks Institute for Self Development, and Barbara Banks, whose daughter Starletta Banks lost custody of her three pre-school children in 2000. Banks said two of the children, now 18 and 19, went straight back home to their mother after aging out of the foster care system. Folmar said she will file an emergency interlocutory appeal of George’s orders to the state Court of Appeals. It is unclear how Judge George was appointed to handle a Wayne County Probate Court case. She is listed as a Macomb County Probate Court Judge. 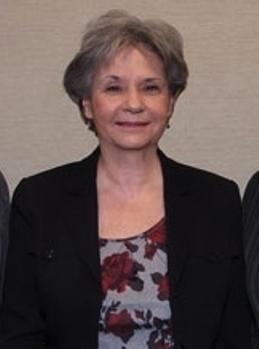 The Michigan State Supreme Court removed her as Chief Judge of the Macomb Court in Jan. 2008 for reasons including her appointment of a high number of cases to one agency, ADDMS Guardianship Services, her high rate of abstenteeism, and her questionable service in the Genesee County Probate Court during her tenure in Macomb County. ADDMS was cited for double-billing estates and mismanaging their wards’ affairs, in numerous reports to the State Supreme Court Administrators’ Office filed by Macomb County Probate Court Register Donald Housey. Housey was later fired from his position and filed a whistleblowers’ lawsuit, which was dismissed by the U.S. Sixth Circuit Court of Appeals. He died of a heart attack at the age of 70. Mother from www.StopGuardianbuse.org website, who her daughter says was badly abused by a guardian appointed by George. After her demotion, George was barred from handling any cases involving wills and estates. She has been investigated by the state Attorney General’s Office, and the state Judicial Tenure Commission, but no charges have been filed. Among numerous reports of abuse in cases handled by George, the website for the National Association to Stop Guardian Abuse, at www.StopGuardianAbuse.org, includes the following report by a daughter regarding a guardian appointed by George for her mother. Atty. Alan Polack, head of ADDMS guardianship services. State Court Administrator Carl Gromek said the Whall report cited other financial shenanigans by ADDMS. VOD is contacting Mack’s office for an explanation of Judge George’s role on the Wayne County Probate Court bench. Little information is available on the attorney George appointed for Mailauni, Mary S. Rowan, but she also displayed a hostile demeanor towards the Williams family’s supporters as they gathered outside the courtroom. 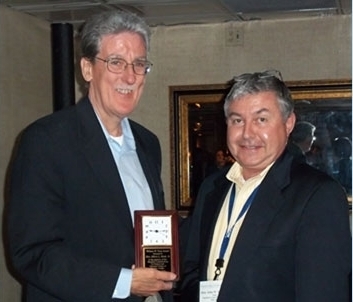 Wayne County Probate Chief Judge Milton L. Mack Jr., (left) received the William W. Treat Award from Judge John W. Voorhees, president of the National College of Probate Judges, at the NCPJ’s fall conference. Mack appointed Kathryn George to hear Williams case. VOD found the following comments about Rowan on two websites. “She grinds up the elderly and turns them into cash (4/21/12),” a Yahoo commenter on its “All Law Firms” site said. “Ms. Rowan seems very unconcerned with the care and welfare of the patients which she takes guardianship over seems to have issues answering the phone and often seems unavailable for the duties which she has pledged to take care of for her clients” (1/25/12). “The Attorney Mary Rowan is not very concerned about the family or the children of a family member that is an Incapacitated Individual. Sitting in court so many times and watching her talk to the family members are disheartening…. never really listening to the members and their loved ones.” (5/16/11). The only positive rating of Rowan was a 4.4 out of 5 on a “peer review” website, limited to evaluations by other attorneys. most county have lawyers that well represent seniors at no cost so its up to you to ensist that her rights are being oup held it takes time and work in your part but it works if you want to put the time in it—I know that it works because I work in behalf of seniors all the time it just takes time and presistant?????? I found out in Jan 2015 Mary S Rowan has 412 active cases in Wayne County Probate Court. How can this be allowed? I knew she many cases. Can you get me the documentation for this? 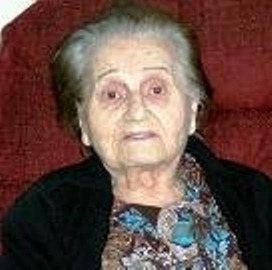 It would be much appreciated by many of those subject to her “guardianship.” VOD is still researching to see what her connections are with the probate court administration, as well as possible connections her husband John Cavataio, allegedly a new basement construction contractor, may have. He allegedly helped his wife in one of the kidnappings. Please send your information to Voice of Detroit at diane_bukowski@hotmail.com, or call me at 313-825-6126. Your diligence is much appreciated. My family has had similar dealings with Mary Rowan. She is very curt and condescending. She does not display one ounce of compassion toward her clients or families. I do not know how she has gotten away with this treatment. She is very intimidating and threatening. What is the best way to file a complaint against her? I feel sorry for any family that has to tolerate this so called lady. Mrs. Rowan has NO business being a court appointed guardian.